The Microsoft Windows 8 Tablet is finally approaching anxious Windows 8 fans. Microsoft Developer Network David Washington provided us information and reports on the recently released Windows 8 designed of portrait and landscape mode of Windows 8 on the future tablets that will be integrated with the OS. Microsoft released the detailed work for the portrait and landscape optimization on Thursday. They did research and work to enhance the design of the Windows 8 and with a thorough approach when it comes to applying the platform in different aspects and ratios. David Washington said they have spent hours in studying on the people who are using the tablet devices in their usability labs and also in the comfort of their homes. The giant software maker revealed its studies and allowed them to take a closer look on the specific needs of the Windows 8, so they can work out the body postures of the users, movements, and interactions with different applications when they use the tablets. According to Washington, the postures, grips, and orientation on tablets change frequently giving them the basic conclusion on their contribution. The number of combinations that are staggering surfaced as they continue working on the research. They also found out at hand that there are different ways to hold a tablet device, and users would like to seek the comfortable position when they use their tablet and get better position and orientation that feel right when they use the device. As they continued their study, Microsoft decided to some goals for the Windows 8 optimization for landscape and portrait solutions. First, the company set their eyes on the easy rotation of the tablet to enhance ergonomic posture when users browse through their tablet. Second, they also considered the rotation of the Windows to be fast and fluid. Third, they set Windows to rotate in a predictable way when users come across the system and apps, so they maybe be able to give the users the full control. Lastly, they considered the possible developers side, so they can easily build and created high-quality design of layout either in portrait or landscape mode, depending on their preferences on what experiences they want to provide for the users. Microsoft did a thorough study on the ways of reading news when using the web browser on portrait mode, and when viewing the photos, scrolling the emails and other methods. According to Washington, they have integrated the system experiences such as the keyboard, file picker, and charms so it can greatly work when the tablet is either in portrait or landscape mode. They work hard to get it right so that when you switch to portrait mode, you don’t have to relearn the system, which works just fine. Microsoft thoroughly worked out on the rotation which is greatly enhanced in the Windows 8. The giant software maker did a lot of work and made efforts to provide a smooth experience for the users as possible as they could. Washington said they are trying their best to work this out especially the rotation to be stable and predictable as possible, because they know how annoying, it is when tablets get an over-eager rotation when using it. Microsoft considered stabilizing the accelerometer in a tablet device running in Windows 8 before the rotation starts. This will be of great help in the prevention of accidental rotations, especially when you are on your tablet. Washington said they introduced this new hardware orientation lock so it can override gravity and keep the orientation table just as the user wants it to be. Microsoft Windows 8 is designed to run on different screens. Microsoft designed it to support a number of aspect ratios such as 4:3 and 16:9. Washington said that the scaling platform of Windows 8 and apps can perfectly adapt and flow the content when used in different screens; also it fits perfectly and makes use of the space. 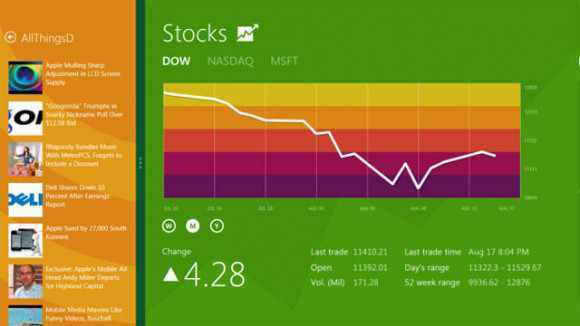 With Microsoft’s Windows 8 supports, it will allow the apps to adapt to a specific screen and ratio. There is also a minimum resolution for Metro apps on Windows 8, which is 1024 x 768. They decided to choose the size because it is the common designed and size when users browse through the web, and they have discovered that a strong majority, for example, 98.8% of Windows users are adapting this resolution, and some required higher. They considered the importance of having a minimum resolution for apps. They also gave consideration for developers to design their apps in the smallest main view without fragmentation on devices.